Blythswood Square is synonymous with luxury and famed for its luxurious spa. 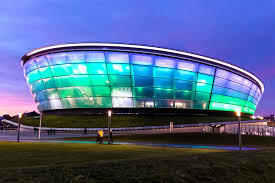 It therefore comes as no surprise that the hotel is first on the list of places to stay for many of the celebrities that are performing at the nearby Glasgow SSE Arena. The hotel decided in 2017 to completely renovate the Penthouse Suite, adding many luxury finnishes to the facility, including a Steam Room with shower fittings by Hansgrohe. 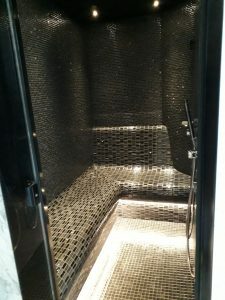 Completed steam room in luxurious glass and marble mosaics, and including under bench LED lighting. 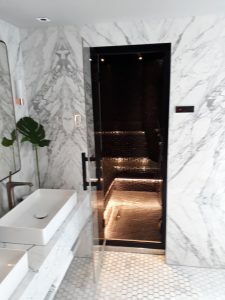 Those fortunate enough to be staying in the Penthouse Suite may now relax in the steam room, listen to music of their choice via the integrated SoundBathe speakerless sound system, and also enjoy not one but two Hansgohe Raindance overhead showers.